A day after warning Central American governments they risked losing U.S. aid if they didn't do something and saying that anyone entering the country illegally would be arrested and deported, Trump turned his sights on Democrats and urged Republican allies to campaign on border security. "Hard to believe that with thousands of people from South of the Border, walking unimpeded toward our country in the form of large Caravans, that the Democrats won't approve legislation that will allow laws for the protection of our country. Great Midterm issue for Republicans!'' Trump said in a Wednesday morning tweet. "Republicans must make the horrendous, weak and outdated immigration laws, and the Border, a part of the Midterms!'' he continued. Migrant Luis Navarreto, 32, said he had read about Trump's threats regarding aid to his country but was undeterred. The migrants are fleeing widespread poverty and gang violence in one of the world's most murderous countries, and many blamed Honduran President Juan Orlando Hernandez for what they called unlivable conditions back home. "We are here because of Juan Orlando,'' said migrant Nelson Zavala, 36, adding that the last three days had essentially been sleepless ones. The previous day, the migrants advanced about 30 miles (48 kilometers) from the Honduras-Guatemala border to arrive at the city of Chiquimula. That's a tiny portion of the almost 1,350 miles (2,170 kilometers) they'd have to travel to reach the closest U.S. border. 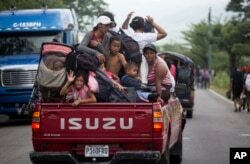 Honduran migrants who are traveling to the U.S. as a group get a free ride in the back of a truck as they make their way through Zacapa, Guatemala, Oct. 17, 2018. Late Tuesday, the Office of the U.N. High Commissioner for Human Rights called on Honduras, Guatemala and Mexico to respect the rights and ensure the safety of the migrants traveling in the caravan. On Tuesday, Honduras' president accused unnamed "political groups'' of organizing the caravan based on lies in order to cause problems in Honduras. "There are sectors that want to destabilize the country, but we will be decisive and we will not allow it,'' Hernandez told reporters. Earlier, the Foreign Ministry alleged that people had been lured to join the migration with "false promises'' of a transit visa through Mexico and the opportunity to seek asylum in the United States. In a joint statement Wednesday, Mexico's Foreign Relations and Interior departments said that anyone in the caravan with travel documents and a proper visa would be allowed to enter, and that anyone who wanted to apply for refugee status could do so. The statement warned that anyone who entered Mexico in an "irregular manner'' faced detention and deportation.